Search Engine Optimization can be extremely helpful, but only if you use the tools available. To help you drive traffic and potential customers you need to weave it with your business’ overall online strategy, including effective keyword research and efficient social media campaigns. Don’t assume that you have to rank high on every keyword related to your industry. In fact, that is the quickest way to significantly drive up your expenses (if you decide to have campaigns on adWords for all of those terms) and it won’t help you attract the customers you’re looking for. I’ll explain with an example – let’s say you’re a plumber in Raleigh looking to bring in more customers. You may think that having your website rank for any and all plumbing terms would be the best way to do so, but it’s not. Of course you want to look at traffic patterns and volume when analyzing keywords, but it becomes more powerful and effective when you then filter it the information with what potential customers would be searching for when they are calling. In many cases a person doesn’t call the plumber until they need them, preferably that same day. They’ve probably tried to fix it themselves and failed, or in some cases, made it worse. They want a solution now so they hop online and type in phrases to find someone who seems skillful and trustworthy. What do you think they’ll type in? You can guess or you can get some concrete answer through keyword research. There is a general process to keyword research, no matter what business you’re in. Creating an initial list. Everyone has to start somewhere. If you use a tool like Google Analytics, you can generate a report listing the keywords used to find your site. If you don’t have that data, then you can start off with some fairly generic search terms based on your industry and products offered on your site. Research and analyze your list. You have to dig into your list and see which keywords meet your business’ s needs. Which search terms not only generate a large amount of traffic, but are also more likely to result in a sale? How competitive is that keyword? Filter the list. With data on your side, you can now narrow down your list and choose the search terms and keywords that are going to help you build sales. Test your list. There’s no substitute for live testing your work. Have metrics set up so you can quickly and easily see where you are exceeding expectations and where you are lagging behind. Refine as needed. As your business grows and change, so will your needs. There are several ways you can find out the demand for specific keywords, both paid and unpaid services. 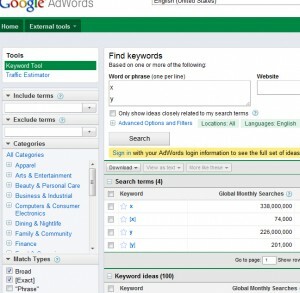 Two of my favorites are Google Adwords Keyword Planner and Bing Ads Intelligence. They are both free to use and they can help you drill down to build a list that can help you with your next campaign and overall online marketing plan. If you running an extensive report and want to quickly gain information on the competition and value on specific keywords, tools like Market Samurai can be an affordable option. Having the right tools is vital the right tools is vital, but more importantly you need to know how to use them or have a partner who can help you use them efficiently and effectively. Many experts will point out that you have to include your customers into every step of the equation. When done right, your time spent can be used not only to optimize your site to better provide for your potential customers, but you can also gain deeper insights into what your customers are searching for.